Researchers at Toshiba’s Akimu Robotic Research Institute were thrilled ten months ago when they successfully programmed Kenji, a third generation humanoid robot, to convincingly emulate certain human emotions. At the time, they even claimed that Kenji was capable of the robot equivalent of love. Now, however, they fear that his programming has taken an extreme turn for the worst. Kenji was part of an experiment involving several robots loaded with custom software designed to let them react emotionally to external stimuli. After some limited environmental conditioning, Kenji first demonstrated love by bonding with a a stuffed doll in his enclosure, which he would embrace for hours at a time. He would then make simple, but insistent, inquiries about the doll if it were out of sight. Researchers attributed this behavior to his programmed qualities of devotion and empathy and called the experiment a success. What they didn’t count on were the effects of several months of self-iteration within the complex machine-learning code which gave Kenji his initial tenderness. As of last week, Kenji’s love for the doll, and indeed anybody he sets his ‘eyes’ on, is so intense that Dr. Takahashi and his team now fear to show him to outsiders. The trouble all started when a young female intern began to spend several hours each day with Kenji, testing his systems and loading new software routines. When it came time to leave one evening, however, Kenji refused to let her out of his lab enclosure and used his bulky mechanical body to block her exit and hug her repeatedly. “Despite our initial enthusiasm, it has become clear that Kenji’s impulses and behavior are not entirely rational or genuine,” conceded Dr. Takahashi. Ever since that incident, each time Kenji is re-activated, he instantaneously bonds with the first technician to meet his gaze and rushes to embrace them with his two 100kg hydraulic arms. It doesn’t help that Kenji uses only pre-recorded dog and cat noises to communicate and is able to vocalize his love through a 20 watt speaker in his chest. When it comes to love, so to speak, accept no substitutes, especially robotic ones. Anyone who has ever been in a relationship knows how dangerous love can be, and unlike most assets that are dangerous when alone, love’s risks can’t be mitigated (yet, we are researching the issue) by being securitized and thrown into structures with things like coverage tests and CCC baskets. Love certainly can’t be derisked by automation, as the Tale of Kenji demonstrates with the power of “two 100kg hyrdraulic arms”. 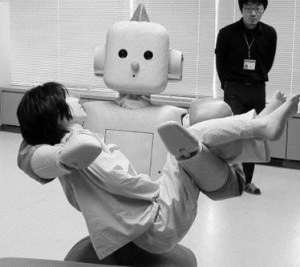 Recommendation: Long human love, short robot love, market weight digital love. The human love asset, like piranha, is a tricky species. But human love assets serve as a great countercyclical investment — they will be there when you need it most, when skies are gray and Skynet has taken over. Rumors of a secular decline in human love assets have been overstated, which is why we continue to find human love assets so attractive. When building a portfolio of human love assets, ensure that the human love assets are unaware of the existence of other human love assets which you own. If they do happen to find about other love assets, and they are ok with it, it is important to document this event with pictures and video, for research purposes. Make sure that human love assets are unaware of the fact that they are considered to be human love assets. It is important to remember their names and refer to them accordingly. Never feed a human love asset after midnight (you will thank us later). If you don’t follow these simple rules, you run the risk of a severe diminution in the value of your human love asset portfolio. I was the owner-operator of an investment fund that focused on building an extensive collection of human love interest assets (Love and Interesting Dating – Symbol: LAID). It worked fine for a long time until my investors discovered it was a Ponzi scheme that I was operating on my own behalf. I’ve since left the fund and salvaged what capital I could, shifting it into a Marriage/Money Mutual Fund (Symbol: MMM-F.U. ), however I’m starting to suspect that the owner-operator is running it along the same lines I operated the LAID fund, though she doesn’t seem interested in maintaining the polite fiction that there will be some future high returns. Even though I’m highly leveraged here, there doesn’t seem to be any way to get the leverage to work in my favor. Any thoughts? You always retain the right to utilize a MAC clause and terminate the investment partnership. Make sure the MMM-F.U. operator understands you are exploring this option. Typically, this tends to increased performance on the part of operator as you will move to an activist investor status (fitness policies and “in workplace dress codes” are examples of achievable capital improvement programs so long as you the activist investor are willing to foot the start up costs). Further, the standard of living for the male investor in similar funds improves dramatically upon MAC implementation. Either way you win. That seems like a pretty good option, Homie. I’m wondering because I recently received a portfolio and very attractive overtures from Social Environment Equitable Trust Yields (Symbol: SECTY). SECTY offered really high yields (offering a big payoff even when SECTY goes down, which the prospectus indicated SECTY likes to do often). SECTY also has a couple amazing, flashy assets that it likes showing off to prospective investors, and it has a tremendous backside operation going as well. It’s hard to see how this investment could go bad, and I can easily see obtaining it, then flipping it. Yet I see risks in it and wonder if it’s a good long term choice. For one thing I’d have to divest MMM-F.U. before or immediately after obtaining SECTY, or risk the loss of both assets. For another thing, the sort of showy assets SECTY flaunts start out highly valued but have been known to sag over time if they aren’t substantially propped up by outside intervention – none of which takes away from SECTY’s spectacular portfolio right now but it bears consideration. Plus the advantage of MMM-F.U. is that although the possibility of long term high yields is dismal, at least I know what I’m getting and the downside seems limited. Not so sure about SECTY, which I had always believed to be overly invested in a non-secured large Banking Fund (symbol: BigBF). If I was sure SECTY wasn’t heavily into the BigBF, it would be a more attractive investment. Good luck getting a MAC clause to stick, especially in that context. Pleb, sometimes it’s helpful when faced with a difficult investment choice to think about which investment you really feel that you could get behind. You don’t want to be stuck in any asset or fund where you will subsequently realize that you can’t get behind it.